Good afternoon, Sir Travis! I would just like to thank you for all he help you have given before our COE application. I am very happy to tell you that just after 3 weeks of application, the result has arrived. I received my gusband’s COE last Friday. He was granted 3 years of stay. Thank you so much!!! I have a question though. My husband’s middle name is ORDOÑO. However, on his COE, it is spelled as ORDONO. I asked the Japanese embassy int he Philippines if there is a need for me to go back to immigration and have it changed, but it said that the spelling is okay. Have you encountered a similar case before? Won’t it really matter once my husband applied for a visa? Another question is, I know that some people get their visas denied even with a COE. What could be possible reasons for a visa rejection for people.with COE? By the way, my husband will be applying for a dependent visa. Thank you so much again, Sir! COEs and Japanese official documents of all kinds can only use the 26 “standard” letters of the English alphabet. Any accented characters – including Ñ – would be converted to their English equivalent. So, don’t worry. The conversion is completely normal. If you look at the two bottom lines of your husband’s passport, they should include a series of capital letters, including your husband’s name written entirely in unaccented characters. As long as his name on the COE matches those lines, he will be fine. The only reasons I know of for someone getting their visa denied even with a CoE is if they fail to complete the visa paperwork correctly (e.g. missing paperwork) or if the condition that they received the COE for no longer exists. For example, if you were to decide to move away from Japan before your husband applied for his visa, it could be rejected because he would no longer be moving there to be with you. I don’t think that should be a concern for you! Thank you once again for your response. Will be sending the documents to the Philippines for the visa application. I would like to thank you for all the help you gave and continue to give to us. May you be blessed more. Your blog has been very helpful, thank you so much for taking the time to do all this. I have been married to my Japanese wife for over a year and a half, we have a one year old son who does not have Japanese nationality. However we all live in my home country Ghana. The Japanese embassy in Ghana does not issue spousal visa even with COE, they only issue a 3 month temporary visitors visa. My question is can we move to Japan and change our status of residence from temporary to spouse/child of Japanese national? My main worries are that my wife has never worked in Japan an so does not have any tax documents or income. We have some money saved up here but I am also currently unemployed. I plan to teach English when I get to Japan God willing. My wife’s Mum is Japanese and lives and works in Japan. Can we use her tax documents for the change of status application? As we were going to do with the COE application. I was not aware that the embassy in Ghana did not process visa applications other than tourist. In general, you can only apply to change your residence status from temporary visitor to a longer-term status if you can show why you were not able to apply for the visa before coming to Japan. If you can get documentation from the Embassy that they do not process visa applications, then that should be sufficient proof for the Immigration Bureau in Japan to show why you were not able to apply for a visa before coming to Japan, so that they can accept your Change of Status of Residence application after you arrive. Regarding your tax documentation, yes, you should be able to use your wife’s mother’s income and taxation documentation, if she is willing to be your sponsor in Japan until you both get on your feet. I would recommend that you first get your son registered as a Japanese national and get him a Japanese passport and at the same time, also see if your mother in law would be willing to apply for a CoE for you. Even though you can’t use the CoE in Ghana, if you have it when you arrive in Japan, it should make the process of applying for a Change of Status of Residence after arrival much smoother. Hi, Sir Travis! It’s me again. I already applied for my husband’s COE last Monday. I am really nervous about what the result could be, so I want to know your insights about my case. Here are some info. I started working for an Eikaiwa in June of 2018. My initial contract is from June 2018-July 2019, but just 2 weeks ago, I received my new contract from July 2019-July 2020. My visa status is Engineer/Specialist in Humanties/International Services. It will be expiring in 2021. I live alone in a rent-subsidixed apartment. I pay 45,000 a month for it, and I also pay my own utility bills like gas, electricity, and water bills. My company as well as the building owner allowed my husband to reside with me once he is able to come to Japan. My gross salary is around 275,000 yen/month. All my taxes are automatically deducted from my salary every month, so I am sure I am paying my taxes accurately and on time. I have declared only one dependent for my tax refund. That dependent is my husband. Since I have only come here in June of 2018, these certificates are not yet available. So I wrote an explanation letter regarding these certificates, and in lieu of these, I submitted printed copies of my salary slip from June 2018 – February 2019. Also, I submitted my Tax Withholding Slip for 2018. My husband and I got married in 2015 in my home country, the Philippines. With all these info, I want to know your insights whether or not there could be reasons for the Immigration not to issue a Certifixate of Eligibility for my husband who I want to bring here as my dependent. Again, thank you in advance for your response! Based on what you have written, I cannot think of any reason why your application for a CoE would be denied. It seems like you have everything in order. Incidentally, though, you posted this comment on a page about applying for a Spouse CoE, which is only for spouses of Japanese Citizens or Permanent Residents. In your case, you should be applying for a Dependent CoE. As long as you have applied for that process, there should be no problems or concerns! Hello, Sir. You are right. I just read today that I posted my comment here. But what I applied for was a Dependent CoE. Thank you very much for your response, Sir. That made me relieved. Thank you so much for all he time you make to answer all the questions we ask from you. You are such a blessing! By the way, Sir, I forgot to ask you this. My certificate of employment does not have my monthly salary, but it is reflected on my pay slips. Also, my Tax Withholding Slip for 2018 has my total income from July-December 2018. Do you think that is okay even if my salary does not appear on my certificate of employment? Thank you again. It should be fine if you have your pay slips. In the worst case scenario, they may ask you to submit a replacement Certificate of Employment that does state your salary. They would not just reject your application outright. If they ask, you would have time to get a replacement Certificate of Employment from your Employer and submit it. I don’t think that would be required, but if it is, it should not be a problem. Thank you so much, Sir Travis! I am still waiting for the COE result. Thank you again for your responses! May you be blessed more! I just want to ask you about my situation. I am cutrently working in Japan. I came here in June of 2018. Now, I want to bring my husband here, but I still don’t have my Tax and Resident Certificates since these are issued only on a yearly basis. I have,however, all my pay slips that show my monthly payment for taxes. I also have my tax withholding slip with me for the year 2018. Do you think these substitutes will be enough? I have also written a letter of explanation regarding my reason of not being able to submit the tax certificates. Yes, if you don’t have your tax paperwork because you haven’t been in Japan long enough, than a letter of employment showing your salary should be sufficient for the application. That was what I used when I renewed my Spouse residence status after my first year in the country! I would recommend that you double-check with the Immigration Bureau, just in case, but that combination has worked in every case that I am personally aware of. Great! I’m very glad to hear that went well. It has been over 8 years since I first applied for my CoE, so I do not remember precisely, but I think it was about 1.5 months. I also submitted it in winter, at a relatively non-busy period, in a regional center, so your results could be very different depending on the timing and where you submit. Thank you again for your response. I am scheduled to lodge the documents for my husband’s Cert of Eligibility on Monday, March 11th, at Kobe Immigration Bureau. I am just wondering if you know, Sir, are March and April busy months for Immigration Offices? Yes, unfortunately, March is one of the busiest months of the year for the Immigration Bureau. April is the start of the fiscal and academic year in Japan, so from Jan-Mar, the Immigration Bureau gets a wave of applications for student CoEs from universities as well as working CoEs from companies taking on new hires (not to mention all the renewals that occur around the same time). Unfortunately, there’s nothing you can really do about that – there is no sense in waiting to apply later. Just keep in mind that it may take a little longer than usual to process. I have a question Travis. I am a widower of a Japanese national. We got married in Japan! I We moved back in 2006. She passed 3 years ago. I was thinking of moving back to Japan for work and to finish raising our 15 year daughter who was also born in Japan. It seems that it would be easier to just get sponsored through an teaching job than to apply for the spousal visa….if even that is an option? What is your advice? The reason being is because looking at all the Jobs available the best ones don’t want to have to sponsor you and want you already in the country. I just wanted to give myself the best options before I got there since I have already been down this road once before. My understanding is that your spouse would still have to be living for you to be able to apply for a spouse visa. (I know that if you were living together on a spouse visa in Japan and your spouse passed away, your residence status would technically lose validity and you would have to leave the country or change statuses at that point). If you have custody of your daughter and she has Japanese citizenship, then you may be able to get a “Long-Term Resident” visa as a foreign parent raising their Japanese national child in Japan, at least until the time that she legally comes of age or gets married, whichever happens first. That would give you time to get your foot in the door in Japan, so to speak, to find a job and change to another residence status. In terms of ease, I think a teaching visa would be easier to obtain, but that does not mean that this is impossible. Hi there Travis, thanks a lot for your dedication in this. I am sure it helps a ton of people. Would you be able to suggest your input on my situation? I am about to move permanently to Japan with my Japanese family and plan to get a Spouse Visa. Since both of us are currently overseas, I could only imagine that my wife needs to go back alone first to help me applying for CoE on my behalf in Japan. >>> This is actually very hard on us because of children. This also means she will be away for an unknown period until the CoE is done (up to 3 months at best), but I couldn’t think of any other possible option since no other proxy is available there. Meanwhile I am also waiting for my current company’s office in Japan to offer me an employment. However, I believe the CoE will rely a lot on the source of income, not the existing cash we have on hand. So, that would be a problem for the CoE if I haven’t got the employment offer since I will be the main financial person. Am I correct to assume that the only path that I can take is wait for the employment offer before my wife going back to Japan for the CoE? And if I change the process to Working Visa in the beginning (instead of Spouse Visa), then later on change to Spouse Visa after I arrived, the overall process above is still the same where I need to get a CoE myself first? If you do not have any family in Japan who can serve as a proxy, you could consider hiring a lawyer or legal scrivener who is authorized to submit CoE applications. There would, of course, be a cost associated, but it might be easier on your family than sending your wife ahead of time just to take care of the paperwork. Whether or not you need to wait on the employment letter from the office in Japan depends to some extent on your current reserve of savings. If you have a significant enough reserve, enough to support your family in Japan for at least 6 months and preferably a year, then you should be able to apply on the strength of your savings. You will likely get a shorter “period of stay” that way, but you can always renew your period of stay after arriving in Japan, when you would be able to show your actual employment status. If you are able to get the job offer letter from the company office in Japan and they can sponsor your CoE, that would probably be the easiest solution, though, assuming that your wife and children have Japanese nationality and do not need visas. In that case, you could arrive in Japan on a working visa status and apply for a Change of Status of Residence after you are living in Japan. The required documents for applying for a Change of Status of residence are the same, but the application form itself is slightly different, and the application process would not require you to leave the country and apply for a new visa. Hi traviz! !my husband already turned in my CoE application with all the necessary and other possible supporting documents.but some friends disclosed me some of not so good anticipations…like our COE approval may take longer time as 6 months,,the reason to which is that my husband is from brazil having only long term residence visa as japanese descendant and i am a filipina.another thing is that he submitted the questionare in english form..can you somehow give me some heads-up please?thank you so much you have been always a huge help. If your husband has a Japanese Descendant status, then the “Spouse Visa” I talk about in this article is not the right one for you. The spouse visa only applies if your spouse is a Japanese citizen or a Permanent Resident. There is a separate “Long Term Visa” (定住者) visa/residence status for spouses of 2nd Generation Japanese Descendants or 3rd Generation Japanese Descendants. The application requirements are slightly different depending on your husband’s generation status and type of employment and there are additional requirements that do not apply to the Spouse Visa. Incidentally, you are required to submit the questionnaire in Japanese or attach a Japanese translation, so they will probably ask you to submit that as an additional document. In any case, the processing time for a Certificate of Eligibility application is always 1-3 months. The application time does not get longer because of your status – although there may be some delays if the Immigration Bureau has to ask you to submit additional documents. Many of the requirements depend on your husband’s status and situation, so I’m sorry I cannot give more specific details, but I would suggest that he might want to consult with the immigration bureau soon to ensure that he submitted the right kind of application and to see what additional documents might be required. How can i get spouse visa from nepal,i am married to japanese national.we have been married on 2015.He came several times to nepal.i gave birth to our daughter. my child has already got japanese passport from Nepal.Now i am planning to go japan. This book will walk you through all of the steps and requirements. I also have a blog article that covers the same topic, though in a bit less detail. Especially if your husband is willing to help you with most of the process, the article may be enough. I am a Philippine citizen residing in Japan holding a long-term visa (permanent). My fiance is US citizen and had an abetting fraud. He finished his probation in 2016. We applied for K1 visa in the US and while we’re waiting for our NOA2 he wants to visit me. Is it gonna be complicated for him to enter Japan because of his fraud? Your response is really appreciated. If your husband is an American citizen, he can come to Japan for up to 90 days to stay without applying for a visa, so there should be no problem for him to visit. Thank you so much !! God bless you !! You can apply for a part-time work permit (Application for permission to engage in activity other than that permitted under the status of residence previously granted) at the Immigration Bureau office after arriving in Japan. If you are hired for a full time job, then your employer will help you get the documentation you need to change your status to a working status. They should be used to that process and paperwork, so all you would have to do would be to follow their directions. Since your husband is applying for your CoE on your behalf, this should be his relationship to you. So, “husband” would be best. And no, you don’t sound dumb, at all – don’t worry! These relationship questions confuse people all the time! Thank you so much Travis Senzaki for writing this incredible guide! My wife is a Japanese citizen and we married in the US, but she suddenly received an offer for her dream job in Tokyo and had to move immediately. We were both having an extremely difficult time finding information on how I could get my visa. Every website seemed to say something different. I stumbled across your guide and that was the best purchase I could have made. I followed your guide to the T and I was able to get my COE and then Visa within one and a half months total and everything went perfectly smooth on the first try! Thanks to you I will happily be reuniting with my wife in Tokyo at the end of this month! I cannot express how truly grateful I am for you having written this guide! You have significantly impacted my life for the better! I highly recommend this guide to anyone about to apply for a spouse visa! Thank you for your kind words and feedback! I can’t tell you how much I appreciate hearing it! I am happy that I was able to help and that you got everything completed so quickly. Best of luck for your new life in Japan! Thank you for all the information you put in your spouse visa article, it is the most comprehensive I’ve read out there! My wife has about 1.600.000 yen in savings do you know if that would be ok? Her father is now retired so we don’t know if his income would be high enough, is there a minimum acceptable income for a supporter? It sounds like you would need your wife’s father to be your financial guarantor. There is no particular minimum to be a guarantor and I have heard of retirees on national pensions serving as guarantors in the past. There is no minimum amount required to be a supporter, but in general you should be able to show that you have at least 80,000 – 100,000 yen in financial support available to you per month (and that’s on top of the person’s own expenses). If you have savings too, even if they are overseas, you can use those together with your wife’s savings as proof of financial resources. 1.6 million yen alone is a little low to be your only source of funding for both of you, unless you plan to live with her parents, but if you have savings, too, it could be enough. How long did you wait after getting married to apply for the COE.? I waited about 6 months because we weren’t ready to move to Japan yet right after we got married. Basically, the only thing that matters with the timing of applying for the Certificate of Eligibility and visa is when you plan to move to Japan. You have to arrive in Japan within 90 days of your CoE being issued. If you need more time to prepare, I would recommend that you take that time first. It will not look bad on your application that you do not move to Japan immediately if you can show that there was a practical reason for the delay and also provide evidence of your relationship continuing in the meantime. It is perfectly reasonable that you would have government paperwork and financial obligations to sort out in your home country before moving! You’d need a tourist visa to go to Japan at first to do the marriage registration. After that, you need the documents listed in this article! If your girlfriend does not have income tax records, she should have some sort of official document saying that she is exempt from tax, instead. She would have to have sufficient income to support you in Japan in order to be your financial supporter/guarantor. That determination will ultimately be up to the Immigration Bureau. If her income is insufficient, then you may need financial support from someone else, as well. I have been married to Japanese 5 years but now divorced. Is there any way to get a long term visa once I lost my spouse visa. If you have children from the marriage who have Japanese citizenship and you are the sole custodian, you can get a residence status to care for them. Otherwise, there is no residence status for former spouses, so you would have to find an alternative way to stay in the country, such as a working status. You cannot apply to change to permanent residency from your spouse status if you are no longer married to a Japanese national. My wife is Brazilian Nikkei and she holds the long term resident visa, we get married here in Japan and applied 2 times for my long term resident visa from here, unfortunately it was rejected both times for not having enough funds (We showed them enough proof with my mother’s bank account showing more than enough 1,500,00 yen or so) . She has an arubaito with an agency in a factory so her salary fluctuates a lot, also she has a kid. So I thought about going back to Spain and apply for the COE for long term resident visa, what it’s your advice? should I try to find a job in Japan while in Spain? and in the meantime save money (Or ask my family to fill my account with a good amount) and then apply for the COE and long term resident visa. My best advice to you would be to find a job in Japan if you can. If you had your own income source in Japan, then there should be no problem with your applying for a long-term visa! Even if you go the other path and try to increase the size of your bank account, then you would still need to try to find a job here after you arrive to be ale to retain your residence through renewals. The questionnaire is meant to be filled in and signed by the spouse living in Japan (the haigusha). I try to make that clear – as well as pointing out who each section applies to – in the book! Hi, Thanks for the pointers and hints.. I am in the process of applying coe for my wife. To clarify things, I am the haigusha? (filipino male living in japan) and my wife is the shinseisha (living in philippines) There is also a return envelope where you enclose the completed questionaire which indicates applicants name? is it my name or my wife’s name to be written?Can I upload a copy of this questionaire in this site..gladly like to help others..
Are you a permanent resident of Japan? If you aren’t then you need to be following a different application process for the dependent visa. I break down the questionnaire in detail in the book, including a full translation and step-by-step instructions, but the “applicant” is the shinseisha is the person applying for the visa. The spouse/haigusha is the Japanese national or permanent resident. Thank you for your offer. There is no way to upload the document directly. If you want to email it to me, I will double-check the contents and post it, but I’m afraid it will take me a little while to get to it as I have quite a backlog of articles and books I need to finish first. Hello! I want to get my husband for a dependent visa but his passport will be expired on oct 2018. We’re both Filipino. Is it safe to travel from Philipines to Japan with exactly or less than 6 months validity of passport and renew his passport here in tokyo since he will be staying here sane with my years of stay. Will it be possibly approved by immigrations in Philippines and Japan. online appointment of renewal of passport in PH is getting worst.,fully loaded schedules online, no walk-in applicants allowed, no agency, unmanageable “passport-on-wheels project” ggrrrrr! Japan does not have a requirement to have a specific period of validity left on your passport when you apply for your Certificate of Eligibility, so it would not be a problem at that point. Like you said, he can renew his passport after he arrives in Japan and that would not be a problem. However, I don’t know how that would affect the visa application process, since that can differ from country to country, and I know the process in the Philippines is complicated with agents, etc. I would recommend that you follow up with someone who has more direct experience with the application process there, too, just to be sure! Hi Travis, based on your “Financial Supporter” flowchart, is it correct that the guarantor info should always go in 24(3), even if he/she is the spouse? Because in your filled out example nothing is written there. Thanks. Sorry, another quick question. Some of my spouse’s relatives live with her at the current address, but never transferred the address officially from the one they used to live, so they do not appear on the jūminhyō. In your experience, what is better to write as their address in the forms? (table on line 20 in the application form and question 11 on the questionnaire). Do I put their legal address (the old one) or the actual one (current) even if they do not appear on the jūminhyō? Thanks. In my experience, legal addresses are more important than actual addresses for government paperwork, so go with what the juminhyo says. If your wife’s family members have not moved their residence registration, then it wouldn’t be necessary to list them as living in the same house (so you wouldn’t have to list them at all, unless they were immediate family to be listed in question 11 of the questionnaire). If your spouse is your guarantor and your financial supporter, then you only need to right his/her information in 26. 24(3) should be for non-guarantor financial supporters. I will have to look at that flowchart again and make sure I connected those lines right. If your husband is a permanent resident, then you would need all of the documents I listed in this article (except the koseki, since he wouldn’t have one of those). I also have more details about the slight differences between applying for a Spouse of Japanese National versus applying as a Spouse of Permanent Resident in my book. If he is just a “long-term resident”, then you’d be applying for a dependent visa instead. You’ll need to follow the instructions I laid out in my article on international marriage in Japan. But instead of preparing the koseki, like you would if you were Japanese, you’d need your proof of eligibility to marry from the Philippine Embassy, the same as your fiance would. I’d also recommend that you check with your city hall in advance to see if they have any additional requirements for you. Some cities add a little extra paperwork. I’m afraid I do not have a sample visa form or CoE application form for the Dependent Visa. I have a guide about how to apply for it at the link above, and it’s much simpler than the Spouse Visa, so I think you shouldn’t have much trouble with it! Hi I am Filipina who has a tourist visa and was invited by my half brother who is a Japanese citizen, he was a son of my father from a japanese woman. My father is a Filipino who have worked in japan at his younger age and met his Japanese wife but separated/divorced when he got back to philippines and married to my mother (Filipina). I got here in japan because of my half brother who invited me for 90 days tourist visa but before my 3months visa will expire I met this man who is very kind to me and we go on a date to make the story short we decided to get married before I get back to my country. We prepare all the papers for the marriage requirements and he was the one who process for the extension of my visa as a fiancée visa. The immigration granted me a 3months extension. But as days and weeks goes by we rarely communicate to each other and his reason was he was so busy with his work but I had found out he was dating with another woman and he told me to cancel about our plan to get married. Luckily, in my time of sadness there was this man who happen to be a blessing in disguise for me who lift me up and put back broken pieces that I had encounter and willing to marry me but the problem is my 3months extension visa was about to expire again. My question is…is there any conflicts if I will get marry to this guy while i was already given an extension visa by another man for a fiancée visa? I hope you could help me and reply my questions as soon as possible. I have only 10days before I go back to my country and on the next day we are planning to go to Osaka to submit all the papers for the marriage. Thank you very much for your time. God bless! Your experience is unlike anything else I’ve ever heard of. I have never heard of anyone getting an extension to their 3-month temporary visitor stay or of a fiance visa, for that matter. So, I’m afraid my advice would not be based on your exact situation. There should be no conflict to your marrying your new fiance. Your marriage registration paperwork at the city hall is not related to your residence status. Since I don’t know anything about the extension you received previously, I’m afraid I can’t say for sure whether or not you’d be able to receive another one, but I think it may be difficult. I would recommend that after you get married, you return to your home country and go through the visa application process from there. Your husband in Japan would apply for a CoE for you and send it to you, then you would apply for your visa. Even that may be difficult, since your relationship before your marriage was short and the Immigration Bureau will want to see proof that it is a legitimate relations, through records of your dating and time together. So, while you are together, I would recommend you do as much as possible to prove that it is a legitimate relationship. For example, visiting his family, going on a trip together, spending time on dates, etc. Even after you return, you will want to be able to show a consistent communication record, as well. can u give me steps by steps process on what to prepare and what to do next ij getting married to a japanese national in japan;? I’ve written another article about how to get married in Japan that might be what you’re looking for! My mother (a Filipina) and Step father (Japanese) have 2 children… they are not yet married. But now my stepfather is planning to marry my mother in Japan. My question is, are they allowed to get married there if she only have a “tourist visa”. Or will it be easier if they will get married here in the Philippines and then apply for “spouse visa” after so my mother can go to Japan? Also, How long will it take for my mother to get a spouse visa and how much will it cost? thank you. In terms of Immigration processing, it would be a lot more straightforward if your parents were to get married in the Philippines, then register their marriage with the local Japanese Embassy. After that, your step-father would return to Japan and apply for the Spouse Certificate of Eligibility for your mother so she can get her visa. Of course, if they want to bring any minor children to Japan, there’s a little more paperwork involved with that. It doesn’t cost anything to get the CoE, except what you have to pay to get the documents you need to apply (copies of the marriage certificate, etc. ), which shouldn’t be much. It’s generally 300-450 yen per copy for the documents you need in Japan. I don’t know about the Philippines, though. I’m also not sure if there’s a visa application fee in the Philippines, since that varies from country to country. I suggest you check with the Japanese Embassy. As for time, after they have all of the marriage process completed, I would figure on about 4-5 months to get the paperwork they need for the CoE application, apply for it (2-3 months processing), have your step-father mail it to the Philippines, then apply for the visa there (I’ve heard that can take 3+ weeks). That’s assuming there are no problems or additional documents required. Ive married in japanese we have two children they are japanese citizen.. But husband died 6 years ago and we are stay here philippines.. My question is can i still apply the eligibility in japan? If your children are Japanese citizens and under the age of 20, you can apply for a “Long Term Resident” (teijusha) Certificate of Eligibility and visa. It looks like you would need a guarantor in Japan plus proof that you will be able to provide sufficient resources to support your children. I would recommend consulting with the Immigration Bureau directly or with an immigration lawyer directly for more information. Currently im living and working in singapore. 34yrs old from philippines. My father is a japanese. Recently he added me in his “kosekitohon”. But since he is old enough and no work at all, he cannot support me financially and I want to clear also if he is eligible or not to apply COE for me because im over 20yrs old. I told him that i can self-support my 1 year stay and once acquire “child of japanese visa”. If possible to submit income tax of my current work and proof of bank statement to cover up my stay in Japan. I’m not sure about the Tourist to “change of status” application is applicable for me, but if it’s possible I want to take the chance since I have multiply entry to Japan as tourist. So anytime I can fly before it expires. Please give me some feedback what I need to do. Thank you very much for the help. I’m looking forward for your prompt response. One more thing, who is my guarantor? According to a few immigration lawyers’ websites, there is no age limit to obtain a Child of Japanese National Certificate of Eligibility, but I would recommend double-checking with the Immigration Bureau, because this is not my area of expertise. Your father would have to be your guarantor, but not necessarily your financial supporter. He should still submit his tax records (I assume he is receiving national pension) and the Letter of Guarantee in his capacity as guarantor, but you would be able to submit your own bank account balances statement to show that you will be your own financial supporter. *Since this is an exception to the usual system (under which the parent is the guarantor and financial supporter), be sure to consult with the Immigration Bureau first. I do not know for sure if you would be able to change your status for Tourist to Child of Japanese National in Japan, but the worst case scenario is that you would be told that you cannot and have to apply for a Certificate of Eligibility, instead, so it would seem to be worth a shot. Based on what you told me about your boyfriend, you should be able to get married to him in Japan, but after you get married, you will have to return to the Philippines to apply for a Dependent Visa. This is different from a Spouse Visa. “Spouse” is only for spouses of Japanese Nationals or Permanent Residents. Unfortunately, it is not allowed to change from tourist status to Dependent status inside Japan. After you arrive in Japan, the first thing you should do would be to complete the marriage paperwork at the city hall where your boyfriend lives. You will both need to get proof from your home countries’ embassies that you are eligible to marry (i.e. that you are of legal age and are unmarried now). After you have filed your marriage at his city hall, he can apply for a Dependent Certificate of Eligibility for you (see the link above). He will mail that to you in the Philippines and you can apply there for a visa. As long as you left Japan while your visa was still valid last time and you were not deported or given a departure order, then you should have no trouble applying for a new visa (both the tourist visa to go there to get married and the dependent visa after you are married). My wife left Japan to her home country.she has spouse visa for one year.It happened she was pregnant and delivered baby while she was in her home country.After delivered a baby ,her spouse visa expired.How can she re-entry Japan? Unfortunately, the only way I know that will certainly work is for her to reapply for a new spouse visa from scratch. If her visa expired very recently, she may be able to ask the embassy for an exception. In my experience, embassies and the immigration bureau are not willing to give humanitarian exceptions, but if she can show that doctors ordered her/her baby not to fly and that she was not able to extend her spouse status before leaving Japan to give birth, they might offer some workaround. How can i get my visa if i already have my eligibility? If you already have your Certificate of Eligibility, your next step depends on where you are. 1) If you are outside Japan (e.g. 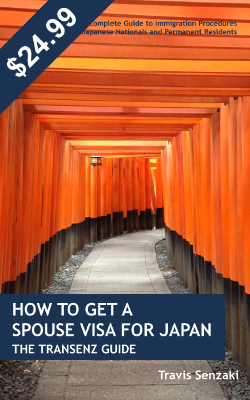 living in your home country), you need to apply for a visa at the Japanese embassy. Requirements vary by country so contact the embassy to find out what you need. 2) If you are living in Japan under a different residence status, then you should take your Certificate of Eligibility, a photo, and your passport/residence card to the nearest Immigration Bureau office to apply for a Change of Status of Residence. In either case, you have already completed most of the difficult part of the application process, so you don’t need this book.